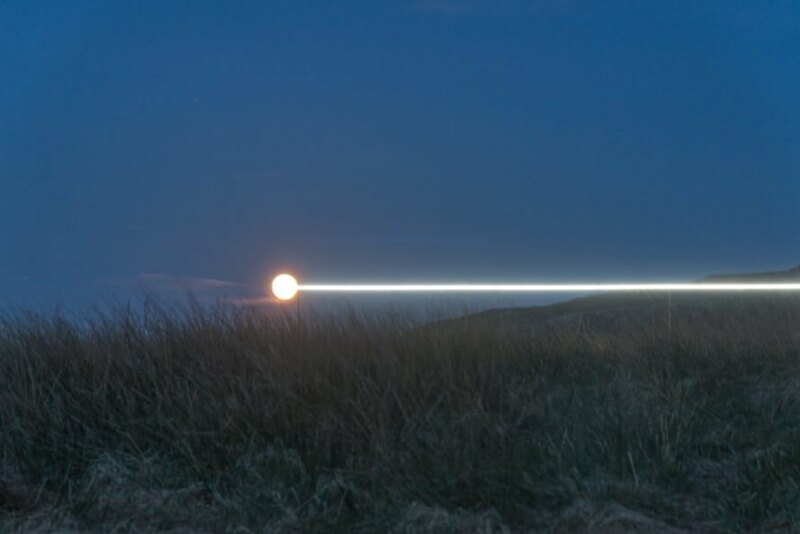 Ghostly white bands of light are illuminating the coastline in the Outer Hebrides to show the potential rise in sea levels that could become reality as a result of unchecked climate change. 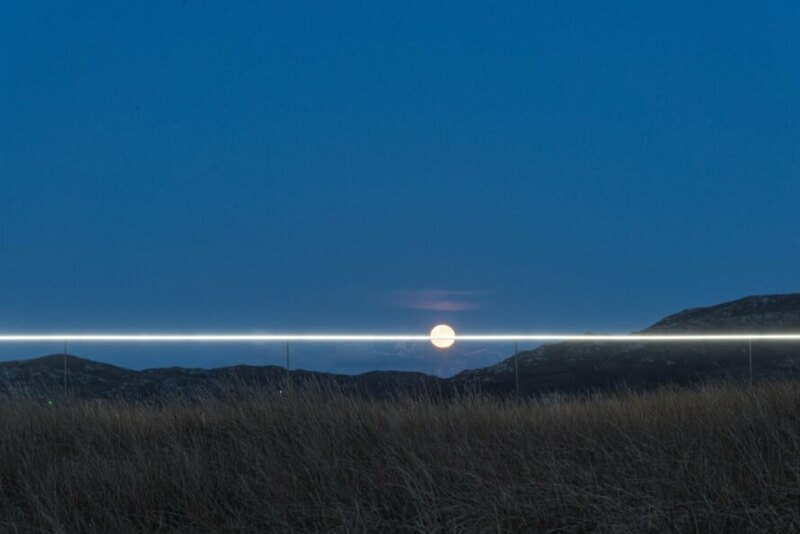 The collaborative and site-specific art piece, named Lines (57° 59 ́N, 7° 16 ́W), is the work of Finnish artists Pekka Niittyvirta and Timo Aho. 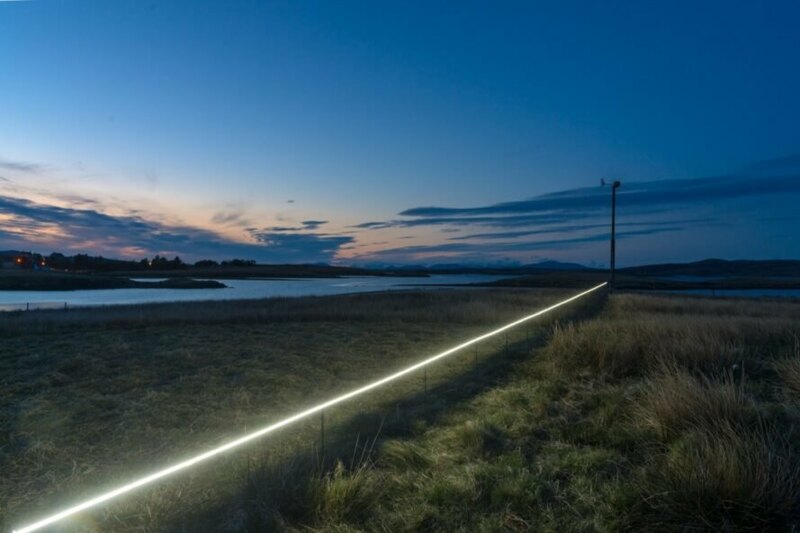 The environmental art installation is embedded with sensors that measure the rising tidal changes and activate three synchronized light lines during times of high tide. Lines (57° 59 ́N, 7° 16 ́W) consists of bright white LED lights, float switches/sensors and timers. Two light lines wrap around the sides of a pair of gabled buildings while the third light line appears to hover above an empty field. The three lines light up in sync with the rising tide. “The installation explores the catastrophic impact of our relationship with nature and its long term effects,” the artists said in their project statement. “The work provokes a dialogue on how the rising sea levels will affect coastal areas, its inhabitants and land usage in the future. The work helps us to imagine the future sea level rise in undefined period of time, depending on our actions toward the climate warming.” Installed May 8, 2018, Lines will run until May 1, 2019.
is the line at 77m above sea level? 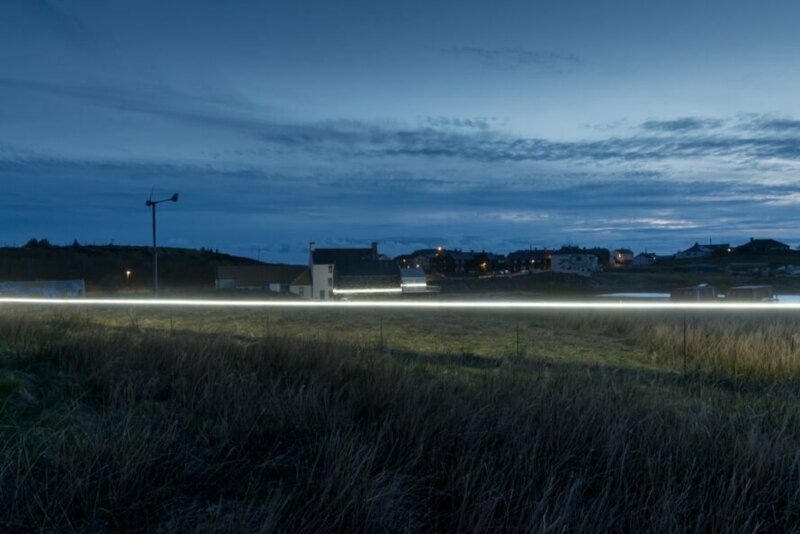 Artists Pekka Niittyvirta and Timo Aho designed this light installation in Scotland. The lights make climate change impact more understandable. The beams of light show where sea level rise will hit if climate change remains unchecked. The lights use sensors to measure rising tidal changes. The site-specific art piece is called Lines (57° 59 ́N, 7° 16 ́W). 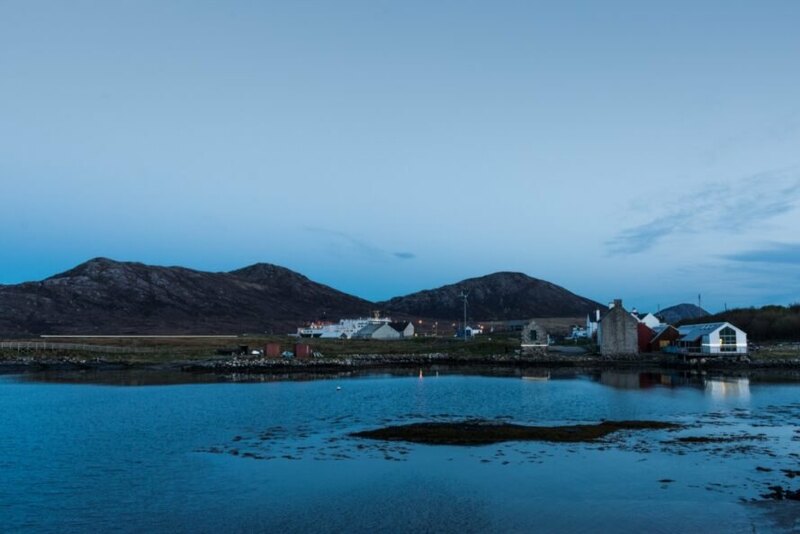 The lights can be found along the coastline of Uist in the Outer Hebrides. Lines is created from LED lighting. The installation also uses float switches/sensors and timers. The lights wrap around two gabled structures as well as slightly above a field. Lines is a shocking realization of how climate change will impact communities. 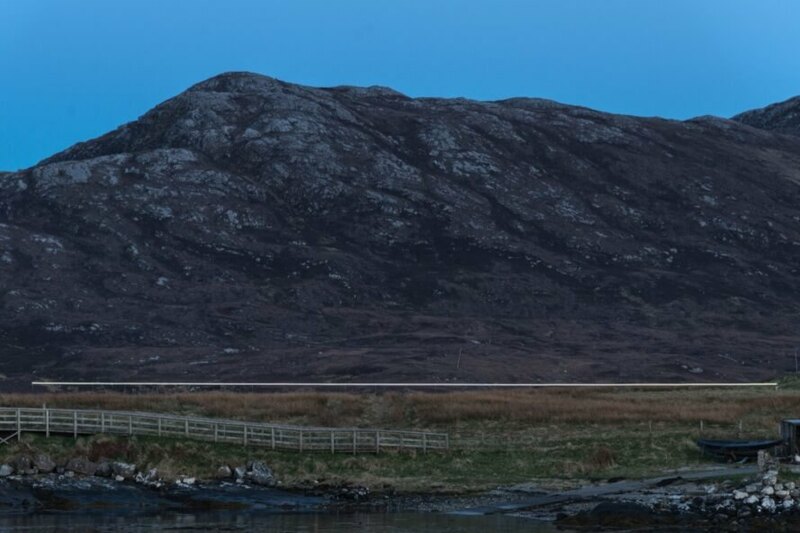 The artwork is installed at the Taigh Chearsabhagh Museum and Arts Centre. The installation runs from May 8, 2018 to May 1, 2019.